Went to Korea for a week, 4 days in Seoul and 3 in Jenju Island. Everyone asked how’s Korea today (question people usually ask when you are back from vacation). And I answered :” It’s awesome! Rain, wind and storm! great trip!” I was seriously soaking wet in Jenju did none of those supposedly stunningly beautiful natural environment tour but only spa indoor at hotel. Seoul’s weather wasn’ t great neither. However, besides the rain and wind, I found some great stuff in Seoul surprisingly in the rain. Dresses, tees, bags, kimchi, and a pair of shoes of the day! A plastic pair with bows on them! 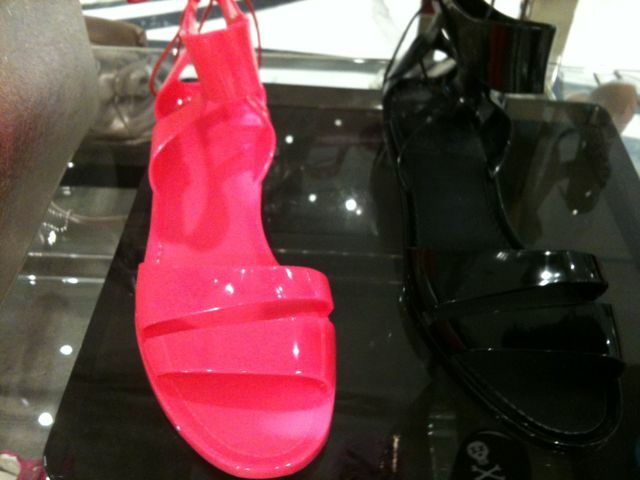 they remind me of Vivienne Westwood Anglomania+ Malissa Ultragirl Bow ! Brazilian imports are all the rage: Gisele, caprihanas, waxing, havaianas, açaí berries… and Malissa! I never bought any plastic shoes before as I stubborning believe they stinks my feet; and yes they will! However, Melissa shoes are plastic made from Melflex, a special formula developed in their lab that is hypoallergenic, natural and, most importantly, recyclable. that makes Malissa’s one of those “wanna have” pairs for quite sometimes and also for their beautiful wearable style. And like those Malissa Gold and the Malissa Flower+Isabela Capeto pieces would probably be bit airy and they smell fruity for some reasons (wonder if that is to cover up the stinky smell!) Well, I can’t stop not sniffing them!! I found this obsessively beautiful black bow pair in one of the boutique near Seoul University. I know you may think I am nasty, but yes, the first thing I did was putting it up close to my nose and sniff. “em.. yum!” It smells great, am serious, it smells like mocha and it’s amazingly comfortable. Bended it a little and it’s absolutely soft and bendable. A nice slip on that will go along fine with my knee-height dresses, leggings and my look alike black ribbon bracelet I bought in Paris last summer. Best news was it only cost USD20! !